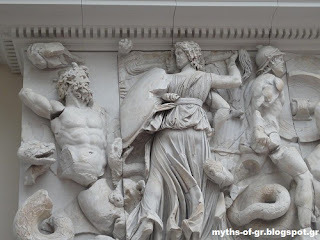 Giants | Learn about Greek Mythology,Greek gods,Greek mythology stories! In Greek mythology the Giants were born from the body of the Earth when the blood dripped onto it from the wound of Heaven after amputation caused by Saturn . In the same way were born Furies and Mellish Nymphs . The Giants were scary and supernatural beings . They had human form but were terrible in appearance and huge in stature with irresistible strength. Their body was scaly and ended with a lizard tail . They had thick hair and long beard . In their hairy hands they held long and shining spears . Although they had divine origin they were mortal , or at least to be killed had to be hit simultaneously by a god and a mortal . Other traditions say that some of the Giants were immortal as long they stomped on the ground where they were born. Predominant part of their birth is Pallini in Halkidiki , an area extremely wild . The Giants were far more by the Titans, the Cyclopes and Hecatonchires. Estimated at around one hundred. Inhabited the western shores of the ocean where were often visited by the gods and took part in their feasts. This was done in the feasts when the Giants offered hecatombs. Even on the road, when the gods encountered them they went with them. However, there was a time that they clashed with them, the famous the Gigantomachy(clash of the Giants). The strength of the Giants was unimaginable.They could easily peel off whole rocks and hurl them away.